If your apartment complex pool is anything like ours, it's 10 feet wide and 20 feet long, which means you can do about 5,000 laps before you get tired. 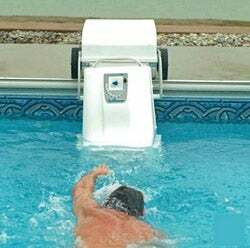 What we need is a pool treadmill, this $3,999 gadget that creates a downstream current so you can swim in place but still be swimming. Sure, $4,000 is a lot of money, but it's pennies compared to remodeling your pool to fit more than two old dudes and some kids.